Digital badges are digital visual representations of accomplishment, competencies, and memberships. They can be displayed on web pages and via social media. 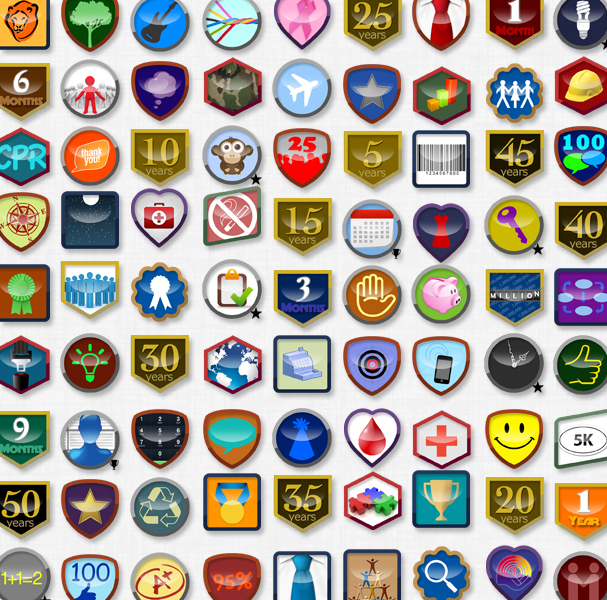 Digital Badges help recognize incremental achievements that are often times not formally acknowledged. They bring together a series of accomplishments to share wins for students. Digitally based, they can be integrated into any number of web environments through the OBI (Open Badge Infrastructure) from Mozilla Open Backpack. They make students employment-ready by visually sharing their competencies with employers. They can be added to ePorfolios and LinkedIn sites. Chicago City Schools used them for their “Summer of Learning” in conjunction with local cultural and civic organizations as well as community colleges. Digital badges capture and document informal education in engaging ways. Perhaps more importantly, they leverage the body of research on the psychology of motivation. These principles are applied to environments through a process called “gamification”. Corporations have embraced gamification to increase use of their products as well as brand loyalty. These companies include Nike, Starbucks, Walgreens, Rite Aid, CVS, etc. Credit cards with points and miles use this as well as grocery chains. Tri-C can utilize this research-proven methodology to train students in behaviors that directly impact completion. Membership-based: for being a member of the Volleyball team, the college newspaper, a faculty professional development group, etc. Competency-based: to demonstrate your, or a student’s, ability to prove a given skill or knowledge base, i.e. basic biology, intermediate programming skills, advanced project management. Frequent Flier-based: to recognize utilization of services – participating in tutoring sessions, student success workshops, campus events, etc. Practicum, co-op or internship based: to recognize “real-world” experiences to further specific job-related skills. Achievement-based: for other specific, significant professional accomplishments.